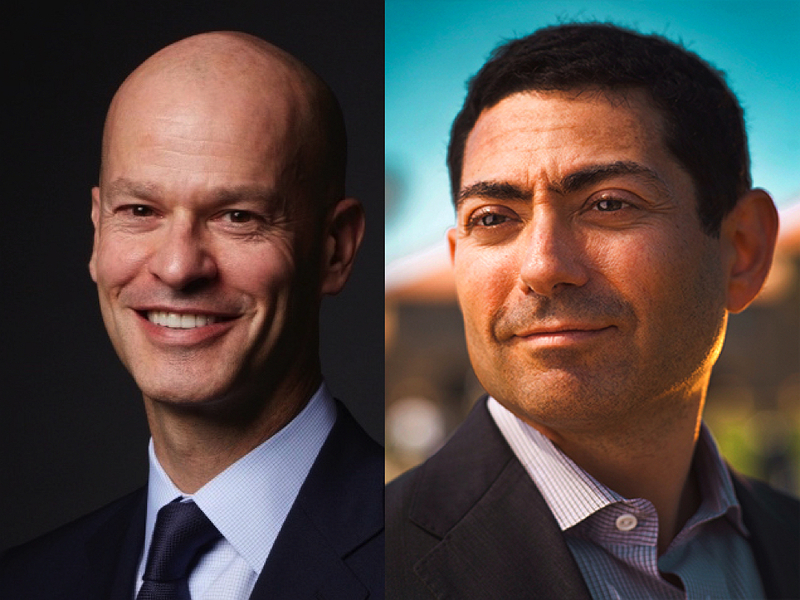 Timothy R. Barakett ’87, M.B.A. ’93, and Mariano-Florentino (Tino) Cuéllar ’93 have been elected fellows of the Harvard Corporation, the senior governing board, effective July 1, the University announced this morning. They succeed Berkeley computer-science professor emerita Susan L. Graham ’64 and Jessica Tuchman Mathews ’67, former president of the Carnegie Endowment for International Peace, who were elected in 2011 and 2012, respectively. The changes are part of the Corporation’s routine process of renewing its ranks; Penny S. Pritzker ’81 and Carolyn A. “Biddy” Martin were elected fellows last May. As part of the reforms of governance adopted in late 2010, fellows are expected to serve fixed terms (typically, two six-year tours, totaling up to a dozen years); the rotation now under way continues to phase that practice into effect, allowing for regular, orderly renewal of the Corporation roster while maintaining overlapping experience and expertise among the board’s other members. The University news announcement identified Barakett, a native of Canada who founded and led Atticus Capital, a large hedge fund, for 15 years, until he wound down its operations in 2009, following the financial crisis and market disruptions of that era. Since then, he has invested personal capital through TRB Advisors, and been engaged in other private financial ventures in investments, reinsurance, and commodities trading. At the University, he served as a member of the executive committee for the Harvard Campaign, which concluded last June (having raised $9.6 billion), and was involved in the leadership of the Faculty of Arts and Sciences’ campaign. According to a 2016 Harvard Gazette article, Barakett, who was himself a financial-aid student, and his wife, Michele, donated $25 million for undergraduate financial aid, a start-up program granting $2,000 to first-year students from low-income families, and the hockey program. Barakett is a trustee and executive committee member for the Dalton School, a past trustee of the New York Public Library, and a past board member for the Mount Sinai Hospital, Continuum Health Partners, and St. Luke’s-Roosevelt Hospital Center. The announcement identified Cuéllar, a member of the Board of Overseers, as a justice of the Supreme Court of California since 2015. He was born in Matamoros, Mexico, and moved with his family to California at age 14. After graduating from the College, he earned an M.A. in political science from Stanford; a J.D. from Yale; and a Ph.D. in political science from Stanford. In 2001, Cuéllar joined the Stanford law faculty, where he became a full professor in 2007 and the Morrison professor of law in 2012. From 2013 to 2015, he was director of Stanford’s Freeman Spogli Institute for International Studies, the umbrella organization for that institution’s international research programs. While on leave from Stanford, Cuéllar co-chaired the Immigration Policy Working Group for the Obama-Biden transition in 2008-09. He then served in the White House as special assistant to the president for justice and regulatory policy in 2009-10, advising on such issues as criminal sentencing, public health and safety, regulatory reform, civil rights, and immigration.